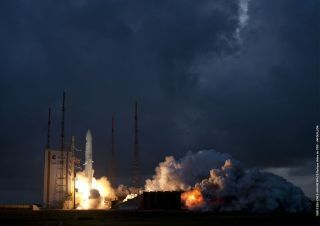 The first Ariane 5 heavy-lift mission of 2013, which launched on Feb. 7, delivered the Azerspace/Africasat-1a and Amazonas-3 telecom satellites into orbit. A massive European rocket launches into darkening skies over tropical South America in this stunning photo. The Ariane 5 rocket, operated by French-based firm Arianespace, blasted off from French Guiana around dusk on Feb. 7 carrying telecommunications satellites for two different clients. The launch successfully delivered to orbit the Amazonas-3 satellite for Spanish company Hispasat and a spacecraft called Azerspace/Africasat-1a, which will be run by the Azerbaijan Ministry of Communications and Information Technologies and the firm Azercosmos 0JSC. Azerspace/Africasat-1a will provide a range of telecom services to Azerbaijan, Central Asia, the Middle East, Africa and Europe, Arianespace officials said. The Feb. 7 liftoff was the 68th total for the Ariane 5 and marked its 54th successful launch in a row. The Ariane 5 heavy lifter is about 165 feet (50 meters) tall. It can boost 10 metric tons to geostationary transfer orbit (GTO) and about twice that much to low-Earth orbit, officials said. The Feb. 7 launch delivered about 10.3 metric tons to GTO, or roughly 22,750 pounds. The next Ariane 5 flight is slated for this coming June. On that mission, the rocket will launch the European Space Agency's Automated Transfer Vehicle 4 — an unmanned cargo ship named "Albert Einstein" — toward the International Space Station.